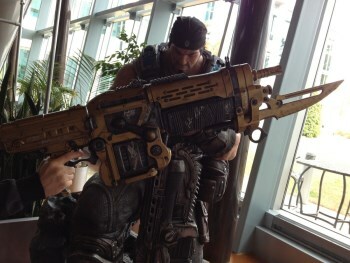 Epic Games is auctioning three signed Gears of War Lancers to help cover the medical bills of an Insomniac Games artist who lost her leg in a hit-and-run collision. Earlier this month, 20-year-old Ana Kessel, an artist with a full-time internship at Insomniac Games, was struck by a car while running errands on her moped. The unlicensed driver of the car fled the scene but was arrested later and charged with felony hit-and-run; sadly, Kessel lost her leg as a result of the collision and is now looking at mounting medical bills, including an estimated $50,000 to $100,000 for a prosthetic leg. She does not have health insurance. A GoFundMe campaign launched to help offset those costs has been very successful, raising roughly $45,000 of a $150,000 goal, and now Epic Games has stepped in to add to the total by auctioning three unique and very cool items on eBay: a signed original Lancer replica, a signed retro Lancer replica and a signed gold retro Lancer replica. All proceeds raised by the auctions will go to Kessel. The Lancer auctions will remain open until November 22 but bidding has already driven the prices sky-high, and all three replica weapons are already pushing the $500 mark. That's a much-needed spot of good news for Kessel but not so hot for Gears fans with not-quite-so-deep pockets; luckily for all of you, a Gears of War 2 Comic Con poster is also being auctioned at a considerably more affordable price - at least for now.